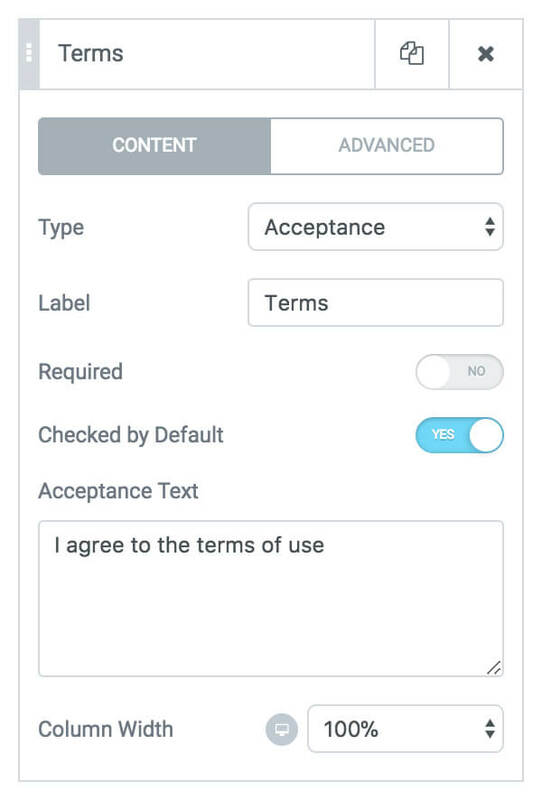 Today, we are introducing several features to the Elementor Form widget, including 6 new fields: File upload, Acceptance checkbox, Date & Time pickers, Password and HTML fields. The Form widget was one of the first widgets included in Elementor Pro when it was first launched. Since then, we have added many useful form features, like our recent integration to several marketing automation and CRM services. Today, we are revamping Elementor forms, adding 6 new form fields, and extending the functionality of several existing fields. Using these new improvements, you can utilize Elementor’s visual form builder to design any type of form you desire. Hiring new employees? 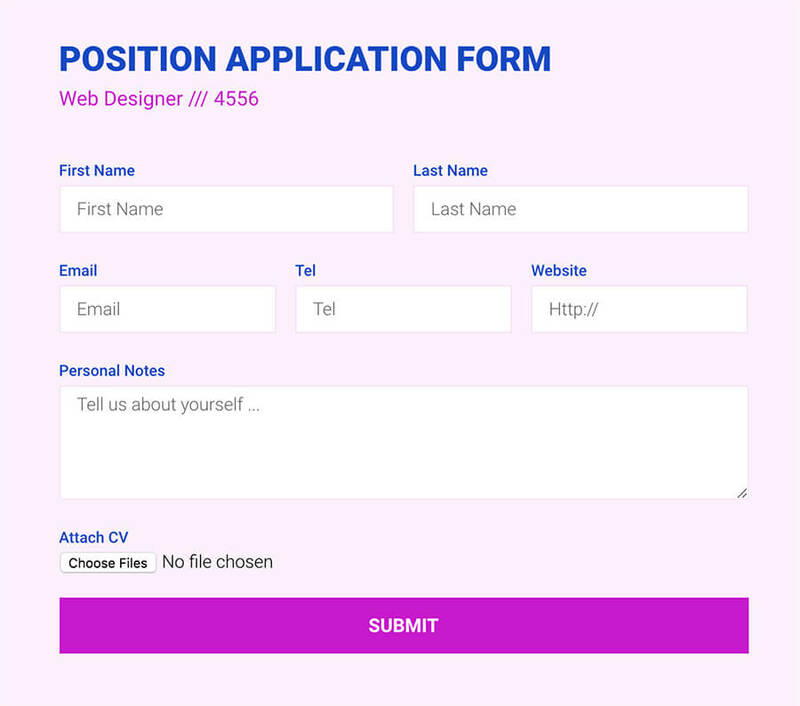 You’ll probably need your candidates’ CVs submitted with their application form. 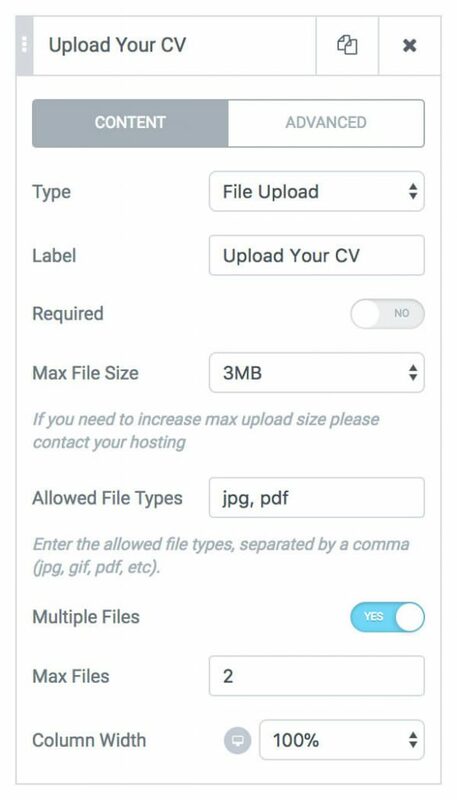 The new File Upload field lets your visitors upload files directly within the form. Maximum upload file size: Limit the maximum file size you’ll receive. Although the absolute limit is set by your hosting provider, you can set a smaller limit using this control. Allowed file types: Set which file types the user can upload. This is important in order to make sure you get the proper file from your users and to improve the security of the form. Allowed multiple files: Let the user upload multiple files at once. Switching this on will add the ‘Maximum files’ control, which limits the number of uploaded files. All uploaded files go through security and validations checks built in to Elementor forms, ensuring your website is never compromised. As expected from an acceptance field, you can set it to be a required field. You also have the option to set the acceptance field as checked by default. Beside using this field as an acceptance field, it also functions as a single checkbox field that can be used for any other purpose. The Date field lets users send a preferred date within their form submission. This is extremely practical for reservation based businesses like restaurants and hotels. 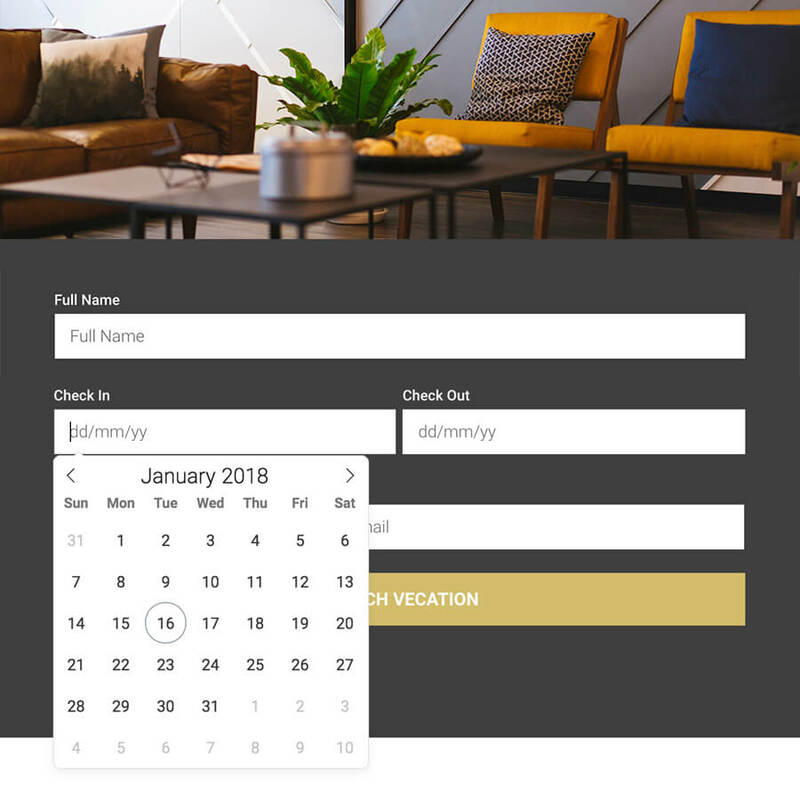 You can set a minimum and maximum date, so it’s easier for the user to pick the correct date. Switch on Native HTML5, so that the browser’s date picker is used instead of Elementor’s picker. On mobile devices, native HTML5 wil be used automatically, since native date pickers on mobile browsers are better supported. The time field is similar to the date field, only the user selects a certain time of day instead of a date. You can actually combine the Time and Date fields inside the same form, to get the user to send you a specific point in time. 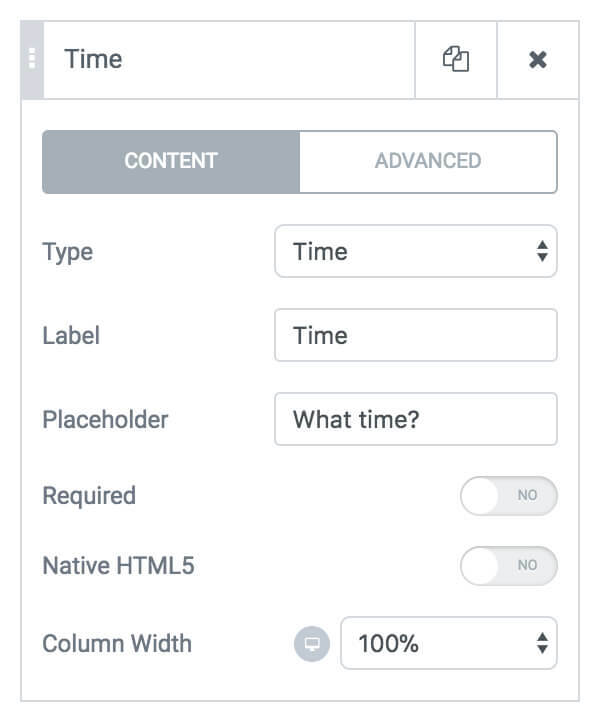 As with the Date field, you have the option to turn on Native HTML5, so that the browser’s time picker is used instead of Elementor’s time picker. Using Elementor forms, you probably got used to building the entire form visually. There are situations, however, where adding custom HTML straight to the form can be helpful. 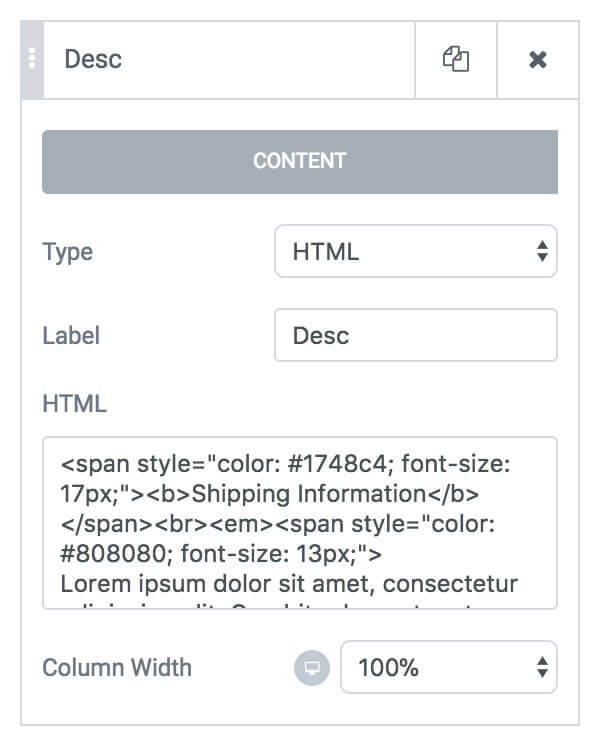 The new HTML field gives you the flexibility to add custom HTML to the form, a handy option for customizations, like adding custom coded titles inside forms. Use this field to let your visitors set a password using your form. 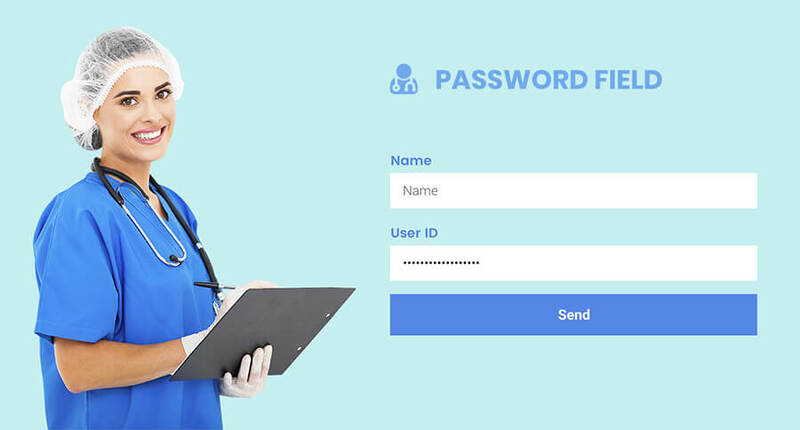 It will enable users to type their passwords without showing the characters, for better security when filling in the field. All this is added to the already broad spectrum of possibilities available in the form builder. We added minimum and maximum values to the number field. This way, the user will only be able to submit a number within the range you specified. Let’s say you own an online slippers shop that only sends 2 to 10 pairs of slippers per order. With the Min and Max validations, you’ll be able to set the min max values within that 2-10 range, ensuring you never get a wrong order of slippers. Email validation was already included in our forms, and now we also added phone validation. This way, only valid phone numbers can be submitted by the user. 0-9  (  )  *  #  +  -  . Once you switch on Multiple Selection for the Select field, the options in the select field will be visible to your user. The user can then submit several options at once, by selecting them in the field. You can also specify the number of rows that will appear visible for this field. Forms play a substantial role for most websites, as it is your primary means of getting leads and conversions. So, it’s no surprise that over the past year, one of the most popular requests we received was related to extending our form builder capabilities. This update was built after we analyzed your requests. Although this was a challenge, we managed to add all the new form features, while keeping the widget as visual and intuitive as ever. 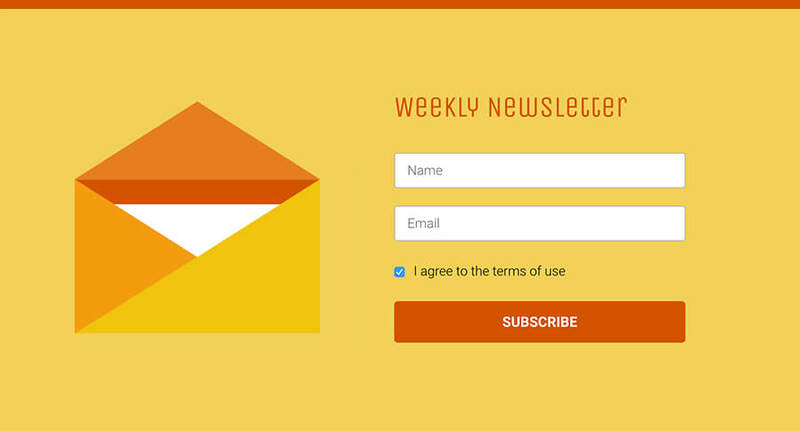 If you’re already a Pro user, I invite you to extend your forms with the added functionality. If you still haven’t upgraded to Pro, now’s the time to join our premium community, and enjoy the best form builder in WordPress, along with many other amazing features. Very nice. I already started making the switch over from previous forms to elementor. I’m extremely happy I purchased elementor pro. Please continue to build and please do not forget to continue to build on the outstanding template library. You guys made my work so much easier. Pretty great stuff here 🙂 Will email validation get added as a default, or still reliant on the browser? WOW This is great!!!! Thanks Elementor (Pro) Team! Thanks you for being part of our community! Just need form entries stored in admin panel as well and I can finally ditch gravity forms for most of my clients. I use this… https://www.sean-barton.co.uk/2017/04/elementor-contact-form-db-free-plugin/ – works really well. Any new wordpress action hook for after form submission to process data from the functions.php !!! Nice, but ‘any form’ is a bit exaggerated. I do miss conditional logic in the form. Fantastic, thanks for the Upload field, I’ve been waiting for this. Many thanks for file upload! Amazing! Keep making your widgets even better! I will stop that right away. You guys are awesome!!! Does this store the data anywhere? If so that’s great – if not then it makes some of this kind of useless for me. I would love to have a great alternative to things like Gravity. Ben, again a killer feature! Elementor is becoming one of its kind page builder. 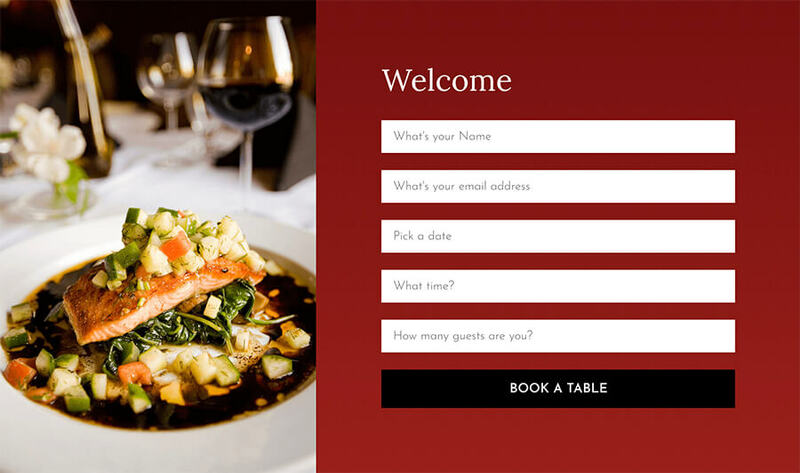 So much time saved, so great useful functionalities to add to any restaurant, bar ot event website. Amazing inquiry forms could be build now with closed eyes and no extra heavy plugins to be installed. Wow !! You guys are nailing it with every update. Mine shows fully updated as well, with no option to update further in WordPress, but my version is 1.12.3 and these options are not available in my forms. Outstanding. Html field expands the possibilities to almost infinite. Where do I have to place the code PHP-Code-snippet? Thanks for Elementor. For me, it is the best page builder out there! Thanks! One thing that would be great to see in the future is conditions and branching! File upload is what I was waiting for. Now I can get rid of the other form creation plugins!! Ben, the best just got better and another plugin has just been made redundant. Thank you. If I can add something to the wish list, conditional logic would be it. But, for now, thanks ? Does the browser’s native time picker adjust for the user’s timezone? In other words, will the form know what time zone they are in based on their browser? Great work. I like the direction you guys are moving but getting to a level where I can remove Gravity Forms from my list of plugins that I have to use is still ways to go but as I said, you guys are def moving the right direction. I think the last 3/5 sites I have built have been OceanWP + Elementor. Just to clarify, could we use this as a site registration form? We do have a login widget, but still no sign up widget. Do you have hidden fields to pass data through for tracking purposes or for tags with regards to marketing autiomations? Yes, there are hidden fields, plus you can add tags with our latest integrations to marketing automations. Hi Ben, can you provide some documentation on hidden fields in Elementor forms? I have been googling around and can’t find any. Also, you seem to be lacking a database for storing form submissions. The one Elementor was recommend we use no longer exists. Not sure if there is a good alternative now? I think I really have done some good karma. Coz I was, from past few days, looking for premium form plugins like Quform2, Ninja Forms, Gravity Forms and many more. And was just about to buy one of them even though I have elementor pro. I was always thinking why I am forced to buy another premium plugin to generate more leads and conversions. But I somehow comtrolled myself and used Elementor pro form widget as it was before this update and decided to wait longer before I could spend some more money. And there it is. So glad, so thankful, so everything good that elementor brought this up just when I needed it the most. I did not want buy some fake or unreliable leads from other companies. And wanted to create some beautiful strategically placed forms on my site to create pure leads for me only. I hope I would be able to do it well now with good SEO optimization and Elementor Pro Form Widget. Wow, this is a major update for most of my sites! Thanks, guys! Thanks Ben!! Elementor and these upgrades are so on point, we are already using it in ourselves and recommending it to our SEO clients – well done! Thanks for every useful change, great work! These are simple HTML fields. Would be nice to finally see some advanced fields, indeed. For example conditionally shown sections, dependant on value of checkbox or select, or sections that are multiplicated by number from a number field. Also an action of type “fire a script” would be nice to see in “Actions After Submit” section. thanks. i did not know of that. I love when you guys add features to help minimize the number of plugins needed for a website. Keep up the good work! Please don’t forget about Google Analytics and Yandex Metrika goals event tracking for the forms and buttons. There is an issue about it on github from me. My subscribers asks about it almost every day. Wow, this is really awesome! Thank you! OUTSTANDING!! Thanks for the continuous improvements and new features! Are you going to integrate ReCaptcha? Very nice! Step by step I can reduce the number of plugins on a few sites! Will there be a possibility for front end post submission sometime in the future? Is there a way to create posts in the front end with Elementor? Anyone else have a fatal error on white page come up now?? Can’t even log in. Ben can I integrate Mailchimp with my New Pro Forms? Hi, Is it possierlich to cremte an PDFs file from the Form ? Create a PDF or receive a PDF? Great. Just what I needed. Tomorrow I will translate your Post into Spanish at webdedicado.com. I have already translated some of the posts. Planning to translate all of them for the Spanish speaking. That is so great and helpful – thank you for spending time on this! Advance form fields? Where is the Conditional Logic? Ben, this is a very great upgrade! However, it just needs “conditional logic” for me to ditch gravity forms forever. Thanks for always working for the community. Form info is sensitive and my host service provider wants me to buy SSL Certificate to encrypt form sender transmissions. But its expensive especial over multiple site where each site is a separate charge. Also they say Google is ranking SSL over non-SSL (all other things being equal) – a SEO benefit. Q: Do you recommend buying SSL Certificates ? Hi Ben, perfect timing for the form update. I was wondering if the date format can be made to read month / day/ year when using the non-html5 version. And, can the time be switched from 24 hr/military time format to display in 12 hr? Thanks Ben and team. This is awesome. Is it possible to run some custom PHP to populate a drop down list, based on the selection of the first value in another form field. Next is to add post fields so that we can have user generated content too. Guessing this is on your list. Great work people. My private hosted site threw up a fatal code today. Could it be related to the new addition? Nice, I have been waiting for the Date field. But in it current state it doesn’t allow me to select the language for frontend use. Kind regards. You can set it so the browser’s date picker is used, getting the language of the browser. What about i11n of the Date field ? It is a date picker independent of the user location. You read my mind, yesterday I was checking plugins to setup forms with uploads and… Tachan! Here they are!… Thank you very much! Just on time! Free plugin for Elementor stores the form submissions in a database and shows in Elementor DB in the dashboard. https://www.sean-barton.co.uk/2017/04/elementor-contact-form-db-free-plugin/. It works very well. You can use the plugin mentioned by Jon or create a Zap (zapier.com) using webhooks to store the formdata in a Google Sheet! that’s what we were waiting for… Thank you Ben! The new datepicker field looked very promising but proved to be completely useless to me. The placeholder text is automatically erased when using native HTML5. Support advised me not to use native HTML5. However on mobile native HTML5 can not be disabled, so on mobile all placeholder text is gone. On mobile i find placeholder text an absolute must to keep the form length acceptable. Have to stick to text fields to enter dates. Too bad. 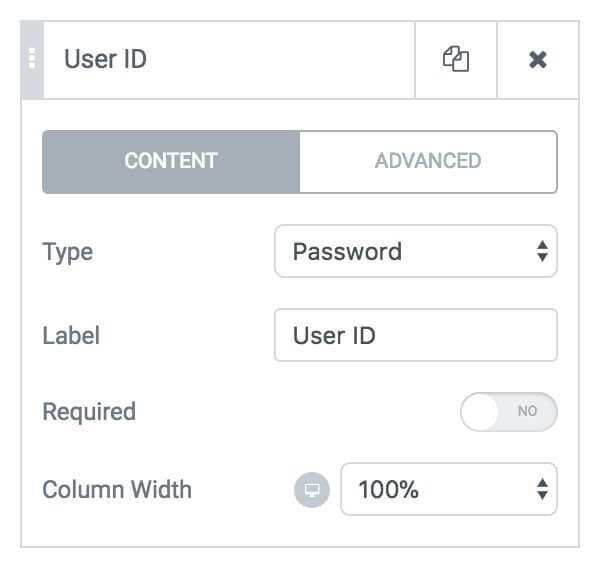 The following content attributes must not be specified and do not apply to the element: accept, alt, checked, dirname, formaction, formenctype, formmethod, formnovalidate, formtarget, height, inputmode, maxlength, minlength, multiple, pattern, placeholder, size, src, and width. thanks ben – just as I checked my plugins this morning i saw on option to update elementor pro. i swear i had checked several times yesterday and it was all up to date. oh well, works now, thanks! Maybe I missed it somewhere in another post but is there a Spam prevention option? Hi Ben, loving all these updates! Please add MailerLite as one of the options that we can connect with for email subscriptions. I know we already have mailchimp and convertkit, but please add MailerLite as well. 1) The added form fields are: File upload, Acceptance checkbox, Date picker, Time picker, Password, and HTML. Q) Where can I find a list of all of the allowed form fields (new and old)? Q) What does “functionality” mean? Q) Where can I find the an list of the current functionalities of the form fields? Yes!! this is exactly what I need from form widget on elementor! this is great! i needed some of these features. however something is missing with the “Acceptance field”. a link to the term page as acceptable. You can simply use a html href for this. Are they accessible from the Elementor interface as I did not see them? If not, how would we integrate? Thanks! Hi Ben, is there any word on when this double opt in will be live on pro version? It is great feature and I really enjoy it. I just wonder one thing that it is possible if all data is automatic save in spreadsheet and we can download it. Ben.. why is it that I can’t see any of the new features (eg date select, autosave etc) albeit having the latest version of elementor? Are we able to add payment (subscription and product) in the form? No, that is not road i would like to follow. Maybe it is an option not to force native HTML5 for mobile by default, but make this an option to be selected or not. (this will lose the possibility to take the browser language) To me it is basic that if you want to use a datepicker it should be able to take the browser language and have placeholder text. Maybe i am a demanding fellow, but without these two characteristics a datepicker is of no use to me. Will stick to the text fields. How created form like https://zapier.com/, change color every move to field. You can add custom CSS for the focus selector to change the form field color for every move. How can i add only text in the middle of the form – only explanation text with no field. Hello, I am new to elementor but just purchased Pro version because of other peoples review online. Can you please guide me where can I find out all that elementor has to offer for its clients? Also any tutorials for newbies of elementor? i don’t know why but i don’t have the option for html field. Are You familiar with Ask Campaigns such as developed by Ryan Levesque? It’s a very popular way of marketing by asking questions to customize experience of visitor. He uses a company called Bucket.io for their specialized questionnaire system designed specifically for that, and includes data transfer to a spreadsheet program allowing deep analysis of the answers that come in. Some also say Google Forms combined with their spreadsheet allows a pretty good system, but requires a lot of customization. … SO, do you have any idea how well your form builder would perform in that function? Thanks for adding form fields. Could you add “confirm email”? +100 and also Conversion tracking support for Facebook & Google Adwords!!! Fantastic. Great development work. Thank you. Your efforts are very much appreciated. Great product, i’m very satisfied with elementor pro features, specially with the form field. But one thing is missing greatly: conditional logic. With that you’ll be ahead of to the popular form plugins, and if you include payment gateways, you’re going to bury them. Hi Ben, loving Elementor generally and the forms are pretty cool. However, I’m struggling with documentation on injecting parameters – I’m using URL-param shortcodes and it works for options on checkboxes, select, etc… – however, I’d really like to insert it as the default value of a text field – e.g. to fill the subject line on an enquiry form based. Is this something we can do, and if not, is it something that might become available soon? Enquiry form based? I’m sorry this might be a bit too technical to me. Can you explain exactly what you want to do? Please give concrete examples. Hi Ben, I think @Philip Brooks means – if you have a form on page called ‘support’, for example – the subject line is auto-populated by a message title like ‘Support Wanted’ and maybe the user is logged in and therefore the email can be auto-populated by the logged in user’s email address etc. These default values/variables would be possible to set in the form and of course the user could change them – or maybe not depending on settings. That way a logged in user can send a feedback form without having to type their email address in because we already have it. I also use Toolset and such variables can be generated using shortcodes like [wpv-user field=”user_email”]. ‘Placeholder’ does not translate such shortcodes in Elementor forms. And the shortcode field in Advanced tab seems to be used to set the field key. But such a feature would be good to make forms even more usable. However there is a host of great form plugins out there, so you lose no stars for the lack of this feature…. Because what a fantastic job you guys are doing with this game-changer page-builder. Thanks and keep up the great work. 1. Surveys and Polls Addon? are there any plans to intergrate with woocommerce product like gravity forms? I am wondering if the price table widget will integrate in the future an acceptance check box. It would be great to be able to use this check box in order to comply with the new european law, which obliges us to get the acceptance from the user of our terms and conditions, before clicking to purchase the product or service shown there. Hi, what about a countries field autopopulated with all the world countries? Is it possible to customize what the user sees after they submit the form? I would like the form to then disappear with a thank you (not just the check mark with form submitted) Thanks! Any plans for a multi-step form? DO you have it on your roadmap by any chance? From our point of view and long analysis, Elementor is the BEST frontend pagebuilder worldwide! If I require the users to login before submitting a post how is this possible? are you able to take payments with Elementor forms? Hi! Is it possible to use a select field and validate as soon as user click an option, without need to click a button? I’m trying to do a select field to change language of a website and once it is selected i want to go directly to the page in that language. Thanks! how to create multistep form using elementor? Question for you … is there any thought about maybe adding a option for PayPal within the forms? So then one could create a subscription form for an event or the like? Is there a way to limit the entries on each form? Let’s say I want form 1 to only accept up to 5 entries and then its closed? Is it possible to change the message that is shown as an answer in the “Acceptance” box? by default it shows “On”, but I would like to change it to “If I accept” or a similar text. Is there a widget to add forms for payment? Once user selects a product, how do we close transaction through elementor tools? Same here, i need to change that message. Is it possible to make the file uploaded by a client to be in the attachment email instead of being a link to recover the file through our server? 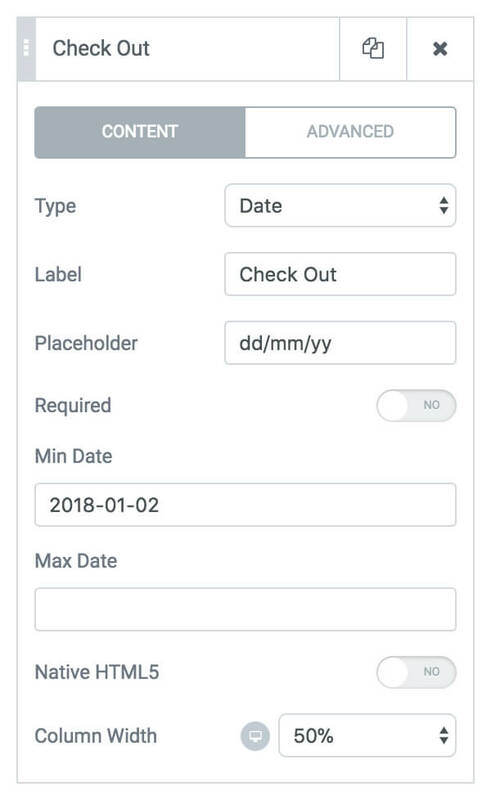 i need possibility to add custom label texts in my forms, not linked to field, something like the html box but without having to deal with html/css ! how to create signup page with elementor pro any one help me. We have a login, but still don’t have a signup widget. Olá! Preciso colocar alguns formulários com cálculos no meu site. É possível fazer com o Elementor ou alguém conhece algum plugin de calculadora que seja compatível? Obrigada! Hello! I need to put some forms with calculations on my website. Is it possible to do with the Elementor form? Or a plugin indication that is compatible? At the moment it is not possible to do it with Elementor form. For forms with calculation fields you can use the Gravity Forms plugin. Can Elementor append form data to redirect url? I am still missing to be able to put an ACCEPTANCE FIELD in PRICING TABLES. It would be good to comply with EU law. Thank you for your suggestion. We will consider adding this in the future. There is the possibility of making a field for the address. Detect the street or geolocalize the user. Could this be done? thank you very much! I would also like the ability to be able to do custom redirects based on form responses. This would additionally allow me to pass a tag into the HelpScout system for automating support request forwarding, kind of essential to me,…. File upload is a great feature. Can I upload excel files? They’re usually blocked by WordPress.. This is gold! Love elementor pro! But we are really missing advanced form validation… like see that the content of two fields matches (two email fields) ortwo date fields to check that the one date must be before the second. Also it would be great to also allow DDMMYY formats. How do I enter the password value that I want guests to type into the password form? 1. What happen if I declare a date field, and I try to write something that doesn’t have anything to do with a date (ie. “hello world”, “123235434534”, etc). Is there any validation message? 2. May I customize the language of the months and days?. I need to use it the calendar in spanish. i.e. I just want the name tag to be FNAME for an integration with a 3rd party mailing system via the web hook. ALso wondering how to pass the form data to the redirect url? Cannot make sense of it. A registration form widget is needed! I have been looking for a way to do this with out adding more plugins. ACF function would be really nice. Please allow us to use conditional logic with Advanced custom Fields. The dynamic fields are good but not enough. Please!!!! It would complete my mission. Good article, thanks. I use some of the forms on my websites, but at the last moment I switched from regular forms to form calculations. Now calculators are very popular and most of all like target customers. I create calculators through the plugin https://wordpress.org/plugins/ucalc/ I tried others, but could not find a suitable one for my requirements. I believe that calculators are the best solution for customers than simple forms, especially when compared with pop-up windows. It there any way to edit or even delete it. Are conditional logic and multi page forms planed for the Elementor forms widget? Yes, these features are on our roadmap. 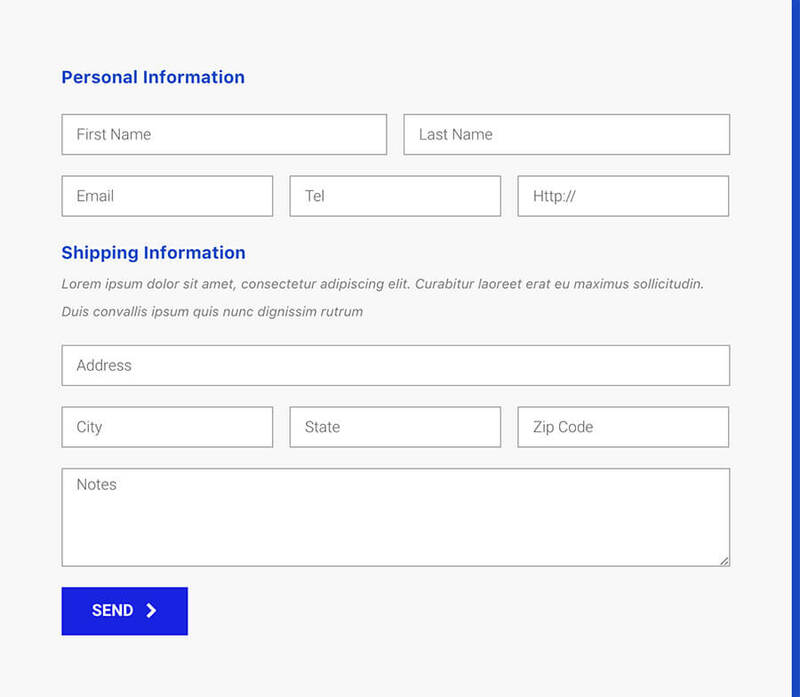 How does one create a front-end form with Elementor Pro & ACF Pro? Please contact our support with further details. Hi Ben: I want to create a web form from a fillable PDF. Then I want to link a database to it and output a non-fillable PDF from it. Can Elementor help with this? If not, can you suggest an add-on that could help or the possible extra programming cost. We all want the double optin! This is like marketing 101!! Literally the first thing anybody does when they create their landing page. Any news guys? Pleeeeaasssee???? Nice! I currently use Gravity Forms to build complex forms, and this is heading in the direction of eliminating one more plugin. The only thing I really like about Gravity Forms is that there’s a space where you can see all the entries and conversion rates for each form you set up. Useful information. BTW, how easy would it be to implement a Zip code validation field, where users would enter a Zip code and it can validate it from a list of acceptable Zip codes where a business provides services. How can I change the language of the required text tip “Please fill out this field”? IF there was conditional logic in the form design I would GO PRO in a heartbeat. How do I add a country list drop down instead of text? Also is there a way to only show the state field if the US or Canada is selected in the country field? This Plugin is AWESOME! Thank you! I receive the file attachment has a URL link in mail on clicking it shows internal server error. Instead is there a way to receive has PDF attachment directly. can the form content be attached to the mail as a csv attachement?